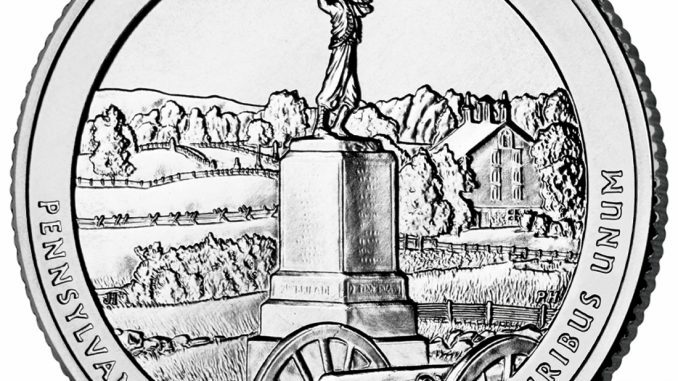 The sixth coin in the United States Mint’s America the Beautiful Quarters series celebrates the United States Military Park at Gettysburg. The United States Mint is the federal agency which provides the people of the United States with coinage. Following the tremendously successful “State Quarters” series, which were minted from 1999-2008, Congress decided to once again change the reverse side (commonly called the “tails” side) of the coin on a completely new series of Quarters. Once again Congress authorized a series of designs which would change year to year (in fact several times a year) over more than a decade. This time Congress decided to celebrate various locations which are under the authority of the National Park Service. While these sites certainly include National Parks, they also include National Historical Sites, National Monuments, Recreation Areas, and Wildlife Refuges. The series is called the America The Beautiful Quarters series, but they are informally known as the National Parks Quarter series. Five designs per year are being issued from 2010 through 2020. But since the series includes sites from several Territories, the series had to be extended through 2021. During the final year of the series there will be six coins issued. 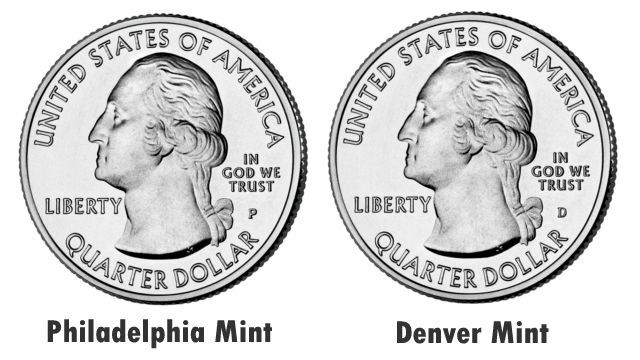 As with the State Quarters series, it was decided that the Mint would spread the designs’ introductions throughout each year. It plans a ceremony to at (or near) the site celebrated by each Quarter. The first coin issued featured the Hot Springs National Park. It was released April 19, 2010. It was followed by quarters bearing designs celebrating Yellowstone National Park, Yosemite National Park, Grand Canyon National Park, and Mount Hood National Forest. These coins were very well received, with thousands of people flocking to the release ceremonies. 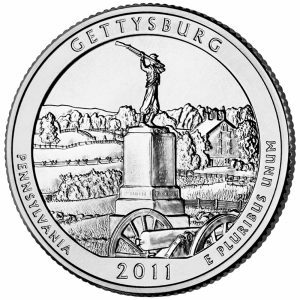 The sixth quarter in the series, released in January of 2011, featured Gettysburg National Military Park. Gettysburg was the site of what was arguably the most significant and well-known battle of the American Civil War July 1-3, 1863, approximately 95,000 Union Troops met about 75,000 Confederates in battle in and around the town of Gettysburg, Pennsylvania. The South had decided to take the war to the North in an attempt to change the opinion of Northerners regarding the war. Confederate President Jefferson Davis and General Robert E. Lee hoped that actually seeing battles on their own territory would horrify the North, causing it to sue for peace. President Abraham Lincoln and his army, led by Major General George Meade, sought to repel the Southern invasion. Over the course of three days the sides fought a bloody battle resulting in 3,100 Union deaths (14,500 wounded), and between 2,600 and 4,500 Confederate deaths (12,800 wounded). More than 5,000 men from each side were declared missing. Although the Battle of Gettysburg included many heroic and tragic moments, the most famous episode of the battle was probably a Confederate infantry charge on July 3. General George Pickett’s division crossed three-quarters of a mile of essentially open fields to assault the Union line. Southern Troops suffered horrific casualties. Pickett’s Charge reached what many have called the “High Water Mark of the Confederacy.” It reached the Union line, but could advance no further and retreated back across the “killing field” the Southerners had just experienced. November 19, less than four months after the battle, a section of the battlefield which had been set aside as a cemetery to honor those who died there was the site of the most historic speeches ever delivered (Lincoln’s Gettysburg Address). Congress authorized acquisition of the site from the Gettysburg Battlefield Memorial Association in February of 1895. Recently the National Park Service has begun a project to “rehabilitate” the battlefield so that historians, students, and the general public can better envision and understand what occurred there. The Gettysburg Quarter’s reverse quarter depicts the 72nd Pennsylvania Infantry Monument, located at the site of “The High Water Mark of the Confederacy”, on Cemetery Ridge where the Confederate charge was finally stopped. The image was designed by Artistic Infusion Program Master Designer Joel Iskowitz and engraved by U.S. Mint Sculptor-Engraver Phebe Hemphill. Will the National Park Quarters be popular? The coin collecting community experienced significant growth during the run of the State Quarters series. Established collectors and the general public eagerly awaited the release of each new State Quarter. Once they entered circulation, State Quarters were often snatched up and inserted into folders, albums, and even specially designed foam maps which permitted the numismatic finds to be placed into spaces within (or close to) the borders of the corresponding state. Each of these storage and display options is also available for the National Parks Quarters Series. Many members of the general public are not even aware of the new series of quarters. 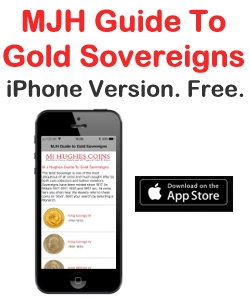 Some people even mistakenly assume that the new issues are simply an extension of the State Quarters program. But as the new coins become more commonly encountered in circulation, casual collectors will begin to notice the new designs. 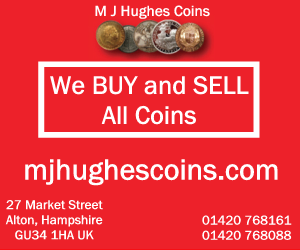 People will undoubtedly set coins aside and begin accumulating a new collection! In addition to re-popularizing the hobby of Numismatics, people will certainly become more aware of the history of the National Park Service, and the presence of these treasures in their states. Regional pride will swell as local people see their community and state celebrated. Also, the new coins will contribute to the coffers of the US Mint due to the premium charged to collectors for collectible grade coins. So the next time you reach into your pocket to pay for a soft drink from a machine look a little more closely at the coins you find there. When the fast food place gives you change for your burger and fries glance at the coins before you stow them away somewhere. You just might find a few of the newly released twenty-five cent pieces. When you do (and you most certainly will begin to see the new coins), close your eyes and take a thirty second vacation. Imagine yourself watching Old Faithful erupt, walking the trails beside the Grand Canyon, experiencing the spas in Hot Springs, or scanning the field where George Pickett’s men bravely fought for the South. And look forward to the next National Park Quarter design which is surely just weeks from being released! Arthur Haule began collecting pennies on Christmas Day, in 1963, when his Grandparents gave him two Lincoln Cent folders with a couple dozen “pennies” in the slots. He has been fascinated with coins ever since. Whether actually working on his collection; attending local coin shows, Texas Numismatic Association, or American Numismatic Association conventions; reading books describing the history of U.S. coinage; or reading one of several numismatic magazines which he devours monthly; coins are always vying for attention with whatever project on which he is working. Art has produced a more detailed discussion of the National Parks Quarter series for the Internet which can be found at http://violin-student.hubpages.com/hub/nationalparkquarter.